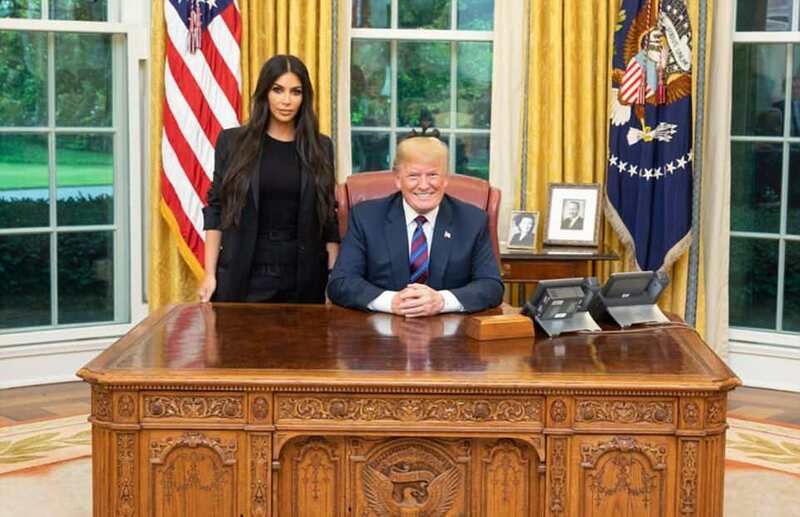 Donald Trump shared a photo of Kim Kardashian in the Oval Office after a 'great meeting' with her discussing prison reform and clemency for an imprisoned drug offender. The reality star spent an hour at the White House on Wednesday in a meeting with the president's son-in-law Jared Kushner that also included a conversation with Trump about a first-time drug offender and great-grandmother Alice Johnson who is serving a life sentence in prison. Johnson was imprisoned for life in 1996 for drug dealing and money laundering after her 15 accomplices all testified against her and had their own charges dropped - despite Johnson's minor role in the cocaine ring. It was her first offence. After the meeting, Kardashian left the White House and headed for Jared Kushner and Ivanka Trump's DC home. Exclusive photos taken by DailyMail.com show the reality star walking inside and laughing with the First Daughter and her husband. She later tweeted: 'I would like to thank President Trump for his time this afternoon. It is our hope that the President will grant clemency to Ms. Alice Marie Johnson who is serving a life sentence for a first-time, non-violent drug offence. Earlier, lawyer Brittany Barnett told DailyMail.com that Kardashian wanted ask President Trump to grant Alice Johnson clemency. 'Today's her birthday, so no greater gift than freedom on her birthday,' Barnett said of her 63-year-old client petitioning for a pardon. Kardashian had a confirmed meeting on prison reform with Jared Kushner, a senior White House adviser. Barnett said it was her 'hope' that Kardashian would also have an opportunity to plead Johnson's case to the president. 'The message to the president is that Alice Johnson, the 21 years she has been in prison, represents a punishment that more than pays her debt to society and that to keep her prison the rest of her life is morally and economically unjustifiable,' Barnett stated.